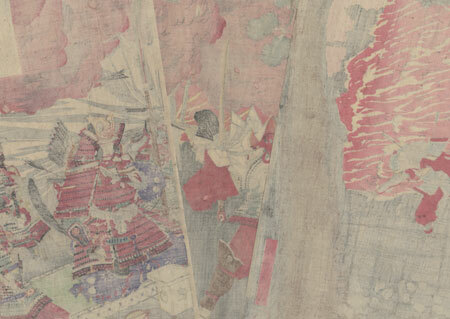 Comments - Dramatic scene of Imperial Prince Moriyoshi, whose nickname was Otonomiya, during his escape to Yoshino. 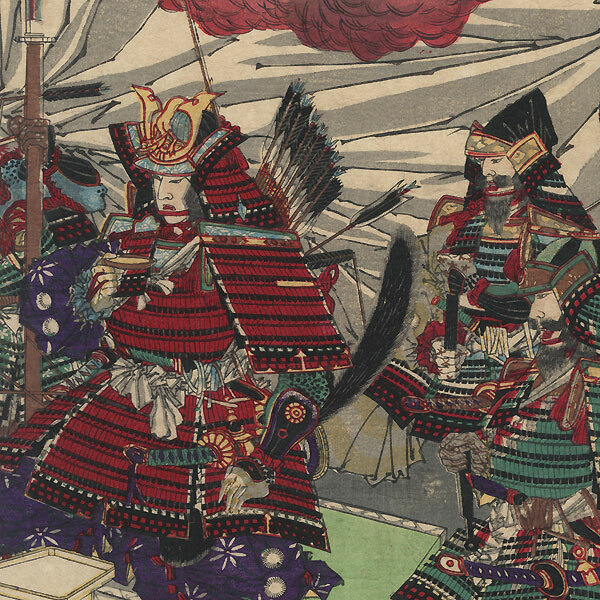 Otonomiya was the son of the 14th century Emperor Go-Daigo, who was forced to flee Kyoto after attempting to overthrow the Kamakura Shogunate. Go-Daigo set up a southern court in the mountainous area of Yoshino, and here, Otonomiya is shown during his attempt to rejoin his father. The prince kneels on a low platform at right, drinking a cup of sake as a retainer bows before him, holding a folding fan to his forehead. Broken arrows protrude from his armor and he wears a horned battle helmet. Fires rage in the distance with smoke billowing over the cloth privacy panels of the encampment. A fascinating subject with soft shading in the smoke. Condition - This print with excellent color and detail as shown. Three separate panels. Vertical and diagonal folds. A couple small tears at edge, repaired. Creasing and wrinkling, slight toning and soiling. Please see photos for details.